We’ll start this year with 6 does and a few kids and intend to grow our herd slowly up to 20 by spring 2015. The idea is to stay small and sell local, and we’ll have just 8 gallons/week of delicious raw milk up for grabs via CSA this coming season! When available, there will also be milk for general sales at the farmstand. At Rock Paper Scissors, our mission is to respect and maintain the health and sacredness of the complete farm organism while providing quality raw goat milk to our local community. 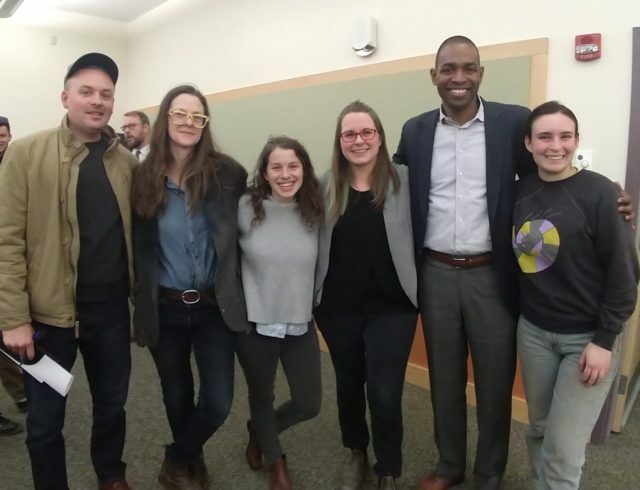 We are thrilled to land at Taproot Commons Farm where we actively participate in collaborative homesteading while also having the opportunity to autonomously run our dairy. Together, we grow our own food, raise poultry, sustainably harvest wood, and support each other personally and professionally. There’s always a multitude of things to do on a farm, and as a vibrant cooperative homestead, we are able to get much more done! Angie’s family farm in Kentucky goes back generations, and farming is quite simply in her bones. She grew up with horses and beef cows, raising chickens for eggs, and gardening with her mother. She was wooed by draft horses while driving carriages in Philadelphia and moved to Massachusetts to volunteer full­time at a draft horse sanctuary her friends opened in 2009. 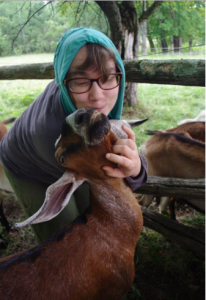 A few years later in 2012, she began working at Big Picture Farm, a small goat dairy and confectionery. It’s nearly impossible to stay away from the delectable milk along with the little faces and big personalities goats bring to the table! After I met the herd, there was no turning back. My journey to farming was an unexpected one to say the least! Despite falling in love with a farmer, I never expected to make farming my life. I grew up in the suburbs, worked with youth as a social worker, and developed a deep passion for writing poetry. 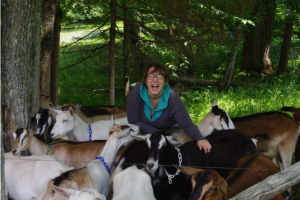 My systems­-oriented and business­-minded self expected to maybe run a non­profit someday, not wash bottles and milking equipment for hours on end while serving an adorable, though wily, herd of goats! 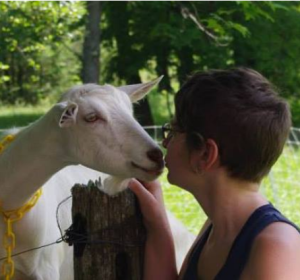 The very first time I milked goats, I knew without a doubt this could and should be my life. Though unexpected, the heart wants what the heart wants, and this adventure is just beginning.